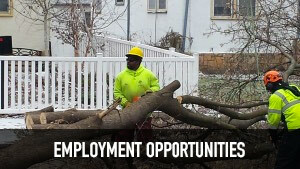 A Tree Services offers Minnesota Tree Removal to the local Twin Cities, Minnesota area. From large, crane removal jobs to removing a single tree branch – we deliver exceptional results. If you need a Minnesota tree removed or multiple trees removed, give our licensed, insured and certified Tree Removal Company a call for a free quote today. It is no secret that tree removal/logging jobs are one of the most dangerous occupations. Which is why safety is of vital importance. Not only to protect our workers but also your property and everyone in the vicinity. Strategy, experience and equipment are the major components of safety when removing a tree. Our team has removed countless trees in Minnesota safely. And always makes sure that every aspect of the job and surroundings are considered. This can mean working with utility companies to shut off powerlines close to the tree removal site, putting cones on the street, using the right safety equipment and machinery. The honest truth is that sometimes it is not possible to prevent all damage. For instance, if you have a large tree that needs to be removed in your back yard and a crane is required to go through the grass to get the job done safely. You may be looking at blemished sod. But, as for your property and surrounding structures, our team is well equipped to ensure your investments stay intact,. Even when a massive tree is being removed. Many of our clients’ schedule tree removal while they are at work, and many like to be at the location when we do the job. Regardless of where you want to be, we understand the importance of being on time. The world is getting to be a busier place, and we understand you don’t have time to wait around for A Tree Company to complete the task at hand. Which is why we are on time, every time because we respect our clients. No one wants a half-removed tree in their yard for hours, days and especially not weeks or months. It is just not a pretty site to look at and it is quite distracting. When you hire A Tree Services, we get the job done the same day. Tree removal can be quite a messy job. And that is why a professional is hired. A Tree Services doesn’t just remove the tree, we clean up the entire area, so when we leave, your yard looks well kept and clean. We remove all the debris from your property and properly dispose of the yard waste. It is important to verify the company you hire for a tree removal service has an ISA Certified Arborist on staff. This will ensure experience, training, and professionalism. The ISA is an organization dedicated to ensuring accountability when it comes to the Arboriculture industry. This entry was posted in Tree Removal and tagged Minnesota Tree Removal, MN Tree Removal, Tree Removal Arborist, Tree Removal Estimate. Bookmark the permalink.